Proper shoes are a must, not just for exercising, but also for everyday use to prevent possible damage to our precious feet and ankles. Tennis shoes, although not suitable for every occasion, are still the best bet provided that they are: a) wide enough at the base to stabilize the ankle and keep you from developing sprains, and b) cushioned at the heel to reduce the chances for spurs or plantar fasciitis, both very painful conditions. 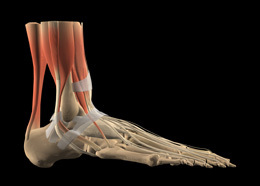 Don't forget that, as you age, the feet widen due to laxity of the ligaments that normally would hold the bones tightly together; you also lose some of the "springiness" of the gait due to the loss of the normal curvature of the foot arch. Don't just buy the same size shoes you've always worn (one's feet never stop growing), try them for fit and comfort allowing for the inevitable changes that have occurred with age, such as bunions and calluses. Special orders can be placed for hard to find sizes, while custom-made inserts should be utilized in limited cases, and by prescription. You don't need to buy an expensive, trendy tennis shoe, but you should avoid purchasing the flimsiest ones, since the poor construction and substandard materials usually employed in these models are unlikely to provide the support you need. Workout clothes must be selected by where and when you plan to exercise. At home, it may even be optional if you don't mind some bouncing, scratches, and the inevitable rug burn. Instead of wearing an old cotton T-shirt and jogging pants, you may prefer to create the right exercise environment by choosing clothes similar to what you would wear at the gym. Both men and women may prefer to wear workout clothes made from one of the modern "breathable" fibers that carries sweat away from the skin and allows for rapid evaporation when perspiring. If you have sensitive skin, choose your outfit fabric wisely since any material that feels itchy when dry can become much itchier when damp. The addition of loose shorts worn as outerwear over skin-hugging gym clothes may allow you more freedom and modesty to perform your exercise routine, and it usually conforms better to the dressing code in most health clubs. Women, well endowed or not, must wear a sports bra for support and comfort. Don't skimp on this item since a good bra aids in proper posture and reduces the unsightly and uncomfortable bouncing. Larger breasts require more support and you should avoid buying them too small or it may make breathing more difficult during exercises. Once you find a good bra, buy two of them to make sure you'll always have a clean, dry one to wear; get new ones every few months since they lose their effectiveness after repeated use due to stretching. Be attentive to the underwear you use since it tends to show more through damp clothes. Men should wear supportive underwear while exercising because it cuts down on chafing, and it reduces the chances of trauma or torsion of the testicles, a very painful condition at best.